MILAN, June 17, 2007 (AFP) - Italian fashion designer Gianfranco Ferre died Sunday June 17th in a Milan hospital at the age of 62 after suffering a brain haemorrhage, the Italian news agency ANSA said. The condition of Ferre, who was admitted to intensive care in the San Raffaele hospital on Friday after complaining of feeling unwell, had deteriorated sharply through the night. According to ANSA, Ferre had already suffered two strokes in the past but had managed to recover, without paying heed to medical advice. The portly designer suffered from diabetes but had never managed to curb his sweet tooth, press reports noted. Born on August 15, 1944, Ferre trained as an architect but soon went into fashion, designing accessories before founding his own label. 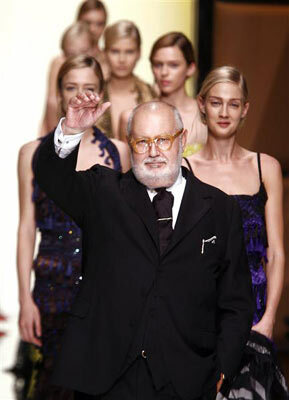 He was artistic director of the prestigious French fashion house of Christian Dior in Paris from 1989 to 1997, when he returned to Italy to concentrate on his own fashion business. At his last ready-to-wear show in February this year, he appeared on the catwalk with the British singer Skin, and the French model Patrick Petitjean, who headed his recent advertising campaigns.